Chief Minister N Chandrababu Naidu will participate in 47th World Economic Forum summit at Davos which begins on Tuesday. 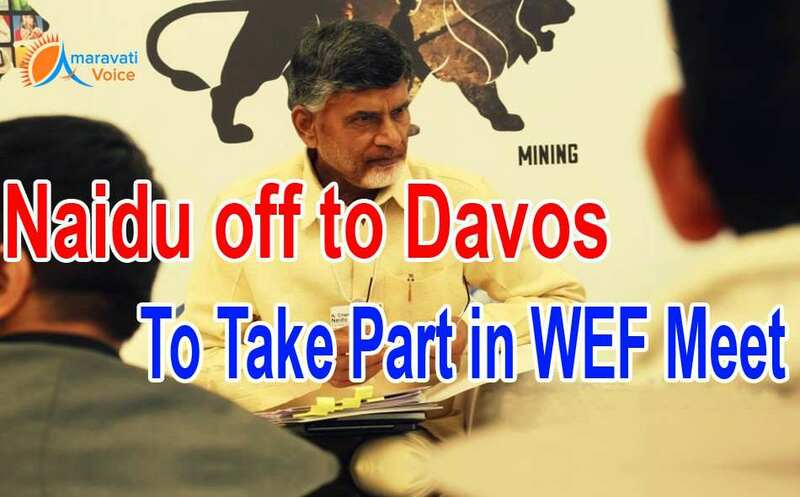 According to the Chief Minister's office, Naidu will fly to Davos from New Delhi in the early hours on Monday. Chandrababu Naidu will take part in meetings with the representatives of European Education and Research Wing in Zurich. Later, the Chief Minister will reach Davos and participate in the Economic Forum meeting which will be held for four days from January 17. The Chief Minister Would discuss on Amaravati capital city construction, metro rail, investments and generation of employment. He is expected to take partin meetings with many prominent personalities. Mr Naidu, in a span of five days of his visit to Davos, will attend about 45 to 50 bilateral meetings. He will also hold multilateral meetings, and one-on-One meeting, arranged by the Andhra Pradesh Economic Development Board. The Chief Minister is attending the WEF meet for the third consecutive year after he became the Chief Minister of bifurcated AP. This year he received the invitation from a member of WEF managing board Philip Rosler. In recognition of the prevailing discontent in societies which are not experiencing growth and development, the WEF has chosen to focus on "Responsive and Responsible Leadership' in its 2017 deliberations to highlight a deeper commitment needed for an inclusive and sustainable growth.